These are the key factors to consider before investing in the consumer goods titan. Its simple business model is a key reason why investors love Procter & Gamble stock (NYSE:PG). The company owns dozens of consumer goods brands -- products spanning categories such as laundry detergent, toothpaste, diapers, and razors -- that millions of people around the world use each day. That market strength translates into sales and earnings growth that tend to persist no matter what else is going on in the world. 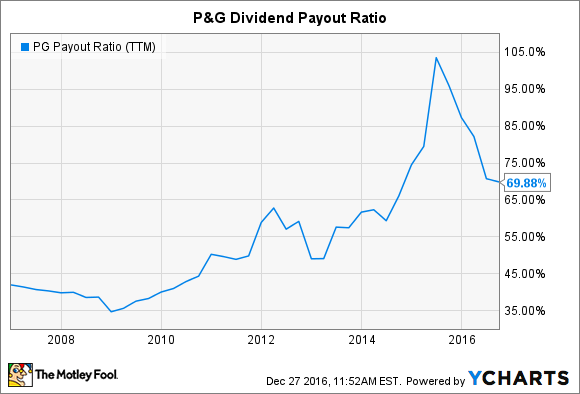 How else could P&G produce a 60-year streak of consecutive dividend raises? But before you buy the stock, either for its price-appreciation prospects or its hefty dividend income, you'll want to know a few things about its biggest operating risks. P&G lost market share in each of the last two fiscal years, resulting in a string of unusually weak revenue and profit growth. Organic sales ticked up by just 1% in 2016 and by 2% in 2015. Unilever (NYSE:UL), by contrast, grew 4% over the last 12 months. Kimberly-Clark (NYSE:KMB) fared even better with 5% organic gains. Sales growth forms the foundation for P&G's business model. Sure, the company can cut costs and make changes to its portfolio so that profitability remains high. However, it simply can't deliver on its long-run profit growth target as long as it's losing share to global rivals. P&G dominates most of the product categories in which it competes. Its Pampers diaper franchise, for example, is worth nearly $10 billion in annual revenue and trounces its closest rival, Kimberly-Clark's Huggies, in the key U.S. market. The Gillette brand delivers P&G 65% of the global share of the blades and razors market (although it is facing more competition from online rivals like Unilever's Dollar Shave Club). But those strong market positions must be earned each year, mainly through the types of innovations that lower prices and/or increase utility. P&G's record has been mixed on this score. The company hasn't churned out a new billion-dollar brand in over a decade. Swiffer, which launched in 1999, is a great example of the kind of game-changing inventions that P&G targets, one that creates an entirely new product category. The company will need to end its dry streak in innovative solutions and produce comparable hits in order to spark market-beating growth over the next decade. Despite its long track record of raises, P&G's dividend has two major weaknesses. First, the company had to pay out more than 100% of earnings in dividends as recently as fiscal 2015. The payout ratio has since drifted back down to a less alarming two-thirds of profits, yet it is still above the 50% range that most blue chip companies manage. Dividend growth has slowed to a crawl, too. After a 7% boost in 2014, shareholders received just a 3% uptick in 2015 and a meager 1% raise for 2016. The good news is that its 3% yield makes P&G stock one of the biggest income generators on the Dow, and improving profits should end the dividend growth slowdown next year. Yes, P&G has lagged the market over the last five years. But cash forms a large portion of the total returns from owning this stock. The company recently upped its annual cash return pace to almost $18 billion per year from $12 billion. Fiscal 2016 is on pace to be a record, too, with $22 billion headed shareholders' way, mostly through stock buybacks. P&G can afford to shower investors with those billions thanks to aggressive cost cuts and the cash infusion that's come from divesting over 100 brands from its portfolio. Management is hoping that by 2018 earnings growth will have rebounded to the point that the company won't have to rely on selling pieces of itself to help boost dividend and fund share repurchases. At 23 times last year's profits, P&G's stock is valued at a premium to Unilever and Kimberly-Clark, which are both going for 21 times earnings. The gap reflects Wall Street's expectation that sales growth will speed up in the coming year even as profitability surges. The elevated valuation also leaves little room for error, and P&G could easily trail the market for another year if market-share trends disappoint again.